Here's a great recipe from FROST BITE. If you are hosting a cocktail party it makes sense to prepare the time-consuming canapes in advance and freeze them. When your guests arrive you can pop them in the oven and enjoy your guests' company and not spend the whole evening in the kitchen. Place capsicums on an oven tray and drizzle with oil. Bake in 180°C (350°F) oven for approx 40 mins or until slightly charred and softened. Place in a bowl and cover with cling wrap and leave to cool. Remove skin and seeds and roughly chop the flesh. In a large bowl combine the ricotta, feta, rice, basil, pepper and roasted capsicum. Mix well to combine. 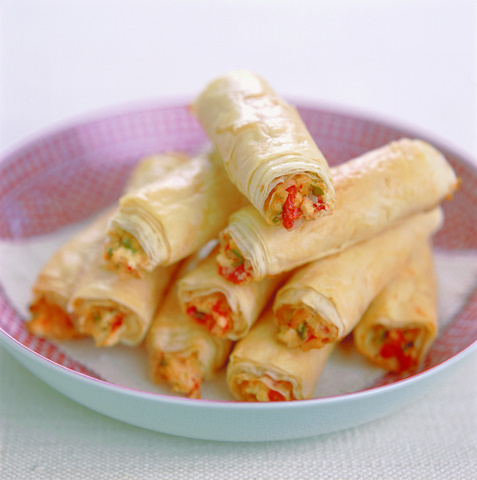 Place a sheet of filo on your work surface and cover remaining pastry with a damp tea towel. Brush the sheet of pastry with melted butter then cover with another sheet. Brush with more butter then run a knife down the middle of the pastry, lengthwise, then cut them down the middle too. You now have four long rectangles of pastry. Place a spoonful of mixture at one end of each rectangle then roll up the pastry to form a log. Brush the top with a little more melted butter. Repeat with remaining filling and pastry. Freeze: ‘Flash freeze’ the logs on a tray lined with baking paper then transfer to a freezer bag or plastic container. Defrost: In the fridge or you can cook these from frozen. Cook: Place on a tray lined with baking paper, allowing some room between logs. Bake in 180°C (350°F) oven for 15-20 mins or until golden brown (longer for frozen pastries).